The BBT was founded in 1970 by His Divine Grace A.C. Bhaktivedanta Swami Prabhupada (1896-1977), the founder-acharya of the International Society for Krishna Consciousness. Srila Prabhupada—as he's known to his followers—translated and commented on over eighty volumes of the Vedas' most important sacred bhakti texts, including the Bhagavad-gita—Krishna's compact tutorial on achieving perfection in life—and the multi-volume Srimad-Bhagavatam—an encyclopedic account of Krishna's many incarnations and devotees in the history of the universe. He formed the Bhaktivedanta Book Trust as the exclusive publisher of all literature containing his teachings, writings and lectures. He intended the proceeds from sale of his books to be divided equally for printing new books and establishing temples—centers of spiritual education and culture. Srila Prabhupada's spiritual master, Srila Bhaktisiddhanta Sarasvati Thakur, was the leading proponent of Krishna consciousness in India during the early part of the twentieth century. He specifically taught the philosophy of Chaitanya Mahaprabhu, the divine avatar who revived Krishna-bhakti all over India in the 1500s. When Srila Bhaktisiddhanta first met the young man later known as Srila Prabhupada - in Calcutta in 1922 - he urged him to preach Chaitanya Mahaprabhu's message of Krishna consciousness throughout the English-speaking world. He also told him, "If you ever get money, print books." After forty years of struggling within India to carry out his guru's order, while maintaining family and business responsibilities, Srila Prabhupada boarded a steamship bound from Calcutta to New York City in 1965. At age sixty-nine, with forty rupees and a trunk of his Bhagavatam commentaries - the first ever in English - his aim was to introduce "India's message of peace and goodwill" to the western world. During the last twelve years of his life, Srila Prabhupada would inspire thousands of Westerners and Indians to devote their lives to Krishna consciousness, launching one of the fastest-growing spiritual movements in the history of the world. Srila Prabhupada's most significant contribution, however, is his books. Highly respected by the academic community for their authoritativeness, depth and clarity, they are used as standard textbooks in numerous universities. His writings have been translated into more than eighty languages. The Bhaktivedanta Book Trust, established in 1972 exclusively to publish the works of His Divine Grace, has thus become the world's largest publisher of books in the field of Indian religion and philosophy. 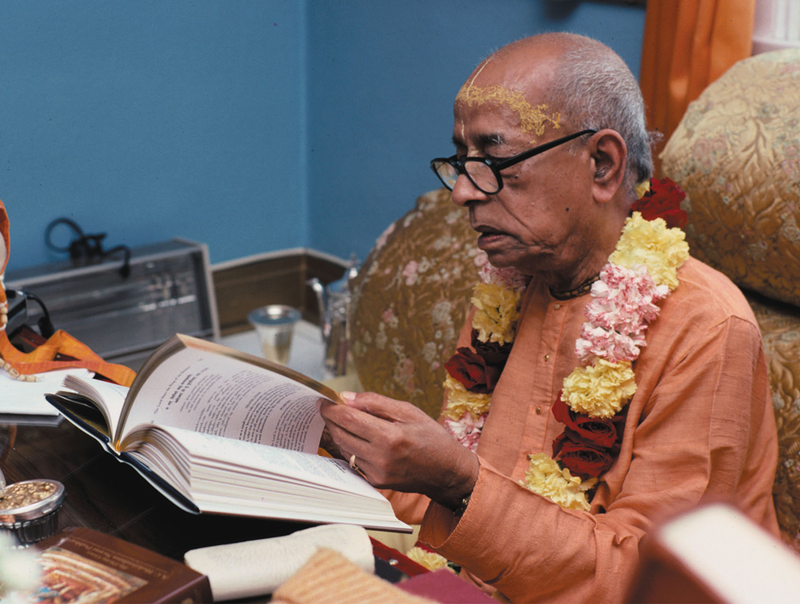 Many scholars and professors who met him and became familiar with his work continue to use Srila Prabhupada's books as standard university texts, and regard him as a genuine, realized, and scholarly teacher of bhakti. His authoritative yet down-to-earth presentation of Vedas continues to inspire a worldwide audience. With the help of his students, he founded the International Society for Krishna Consciousness (ISKCON). ISKCON is popularly known as the "Hare Krishna" movement, due to its members' widespread practice of chanting the Hare Krishna mantra in public. Srila Prabhupada intended ISKCON to facilitate the association and education of bhakti-yoga practitioners, and his followers continue to spread that mission.